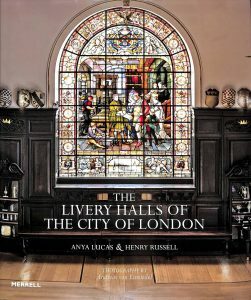 On Friday 2nd November, the Clerk and I were invited, resplendent in our morning dress, to Trinity House for their City of London Corporation lunch to which the Lord Mayor, the Sheriffs, some representative Masters and Clerks, and many involved in navigation, shipping and the City, were invited. The lunch was hosted by the Master of Trinity House, HRH The Princess Royal, to whom we were all presented, and many of the Elder Brethren. I was fortunate to sit next to one of the most senior on the Lighthouse Board, Captain Barker, who improved immeasurably my understanding of lighthouses – albeit I was starting at a low level based on my memories of the cutaway diagrams in The Eagle. On my other side I had the Chief Executive of the Merchant Navy Welfare Board who deals with the complexities of 148 different charities relating to the Merchant Navy, many with overlapping charity objectives. Overall it was a most enjoyable, instructive and rewarding lunch. I should also record my thanks to Past Master Richard Goddard and the Rochester Bridge Trust, because the Trinity House lunch was at the same time as the Bridge Trust’s commemoration of their Founders and Benefactors, which is always held on All Soul’s Day and to which the Master is always invited. The Trust kindly accepted Past Master Goddard as my representative and he gave the address at their lunch. So, what is the connection? The Trust and the Company are linked by the 14th Century knight Sir Robert Knollyes (which the Trust spells ‘Knolles’). He funded the first stone bridge over the River Medway at Rochester in 1392, the event which the Trust commemorates and his wife built the footbridge over Seething Lane for which the Company still pays the fine each year with the presentation of the Knollys Rose at a ceremony at Mansion House. On Sunday, 4th November, Court Assistants Richard Turk and Mark Wilson, and Susan and I represented the Company at the Patronal Festival of All Saints service at All Hallows by the Tower. 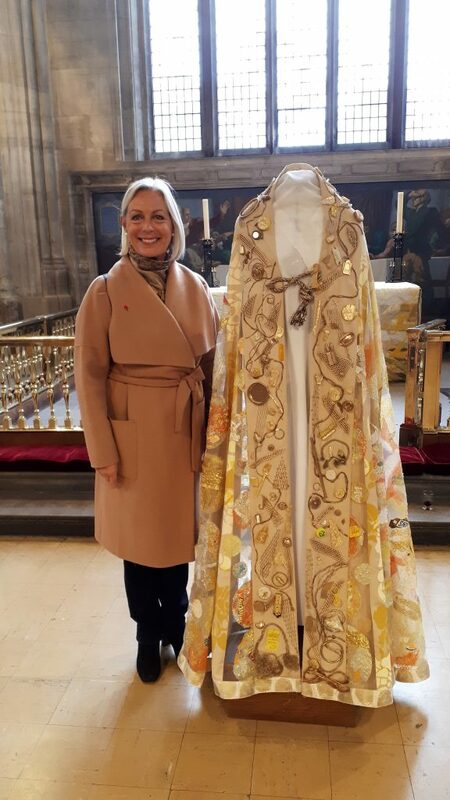 The Service was led by the Bishop of London, The Rt Rev’d and Rt Hon Dame Sarah Mullaly DBE, who wore a stunning, and much admired, cape made by Sarah Wilson from debris collected from the foreshore of the Thames. I understand that Sarah is to talk about her work at the Ladies’ Lunch on 1st April. The next day, I attended the Royal British Legion’s opening of the Garden of Remembrance at St Paul’s Cathedral. After a breakfast and briefing in the Crypt we were directed to the Churchyard Garden where a Grenadier Guards Regimental Sergeant Major did his best to put 110 Livery Masters into numerical order. The Master of the Parish Clerks and I always enjoy the ritual of watching Livery Masters shuffling into order, confident that we must just wait until it is finalised and then place ourselves immediately after the 110th: the Worshipful Company of Arts Scholars. Following the arrival of the British Legion standards, a solemn Service of Remembrance was led by the Dean of St Paul’s with music from the Band of the Coldstream Guards. 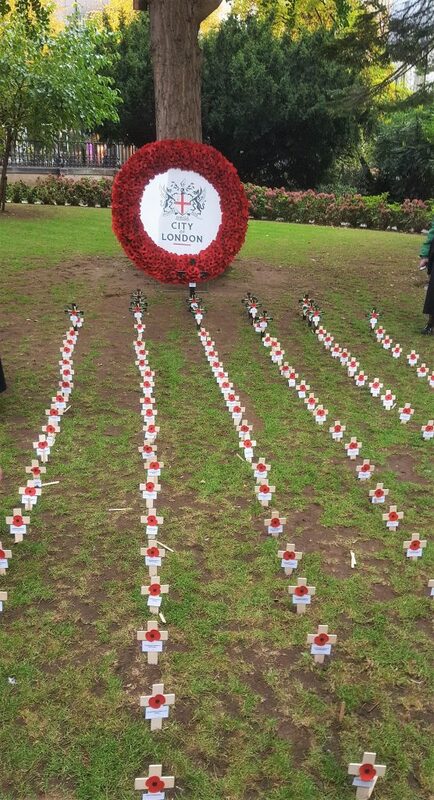 At the end of the service the planting of crosses took place, and, following the Lord Mayor, Aldermen and Sheriffs, and representatives of the Armed Forces, the Masters went forward in fives to place our crosses on behalf of the City companies. The Company crosses at St Paul’s. After the solemnity of St Paul’s, it was only a short walk to the Girdlers’ Hall for a rather more jolly event: a Remembrance lunch hosted by the Master of the Worshipful Company of Cooks – our own Mark Groves, the propriety of Cook & Butler, the Company’s caterers. In keeping with the week of remembrance, Mark’s menu had a First World War theme. Instead of the more conventional welcoming glass of fizz, we were served hot ’Trench Grog‘ in jam jars which was very welcome after a couple of hours in the Garden at St Paul’s! The main course was ‘Tommy Atkins Bully Beef Game Stew‘ and the alternative to ‘Camp Coffee’ (and no, it was not the 1950s chicory essence) was ‘NAAFI tea’. It may have been serendipity but, in keeping with the military nature of the week, I was seated between two colonels so there was much reminiscing before we returned to the garden at Girdlers Hall to enjoy a surprisingly warm afternoon. That evening, all Masters were invited to attend a Service of Thanksgiving for the outgoing Lord Mayor’s year in office at St Stephen Walbrook, the Lord Mayor’s parish church. I had not been inside this Wren church before, and it is very interesting building, not least because the congregation sits ‘in the round’ while the service is conducted from Henry Moore’s huge central polished marble altar. The refreshments that followed provided an opportunity to catch with other Masters. After three events on Monday, the Tuesday was rather easier with just one: a Pan-Livery briefing at Mansion House. The original Pan-Livery initiative had two strands: to improve the communication of what the collective Livery companies were achieving; and to ascertain whether there could be some collective Livery charitable project. As everyone knows (well nearly everyone) the Watermen are not ‘Livery’, but for these events we are counted as one of their number and so the Clerk and I attended to hear about the progress of the Pan-Livery project. The first major revelation was that the concept of a collective charity project was being put aside for the time being and so we could concentrate on the communication theme. To this end there had been three surveys among the City companies to get a better idea of their composition, their charitable objectives and their members’ view of their activities. There were lots of statistics (which I shall not try to replicate here), but there had been a very disappointing response to the survey from the Freemen, which was to be re-circulated in the hope that more would complete it. This has now been done so please do have a look for the Clerk’s email with the link. 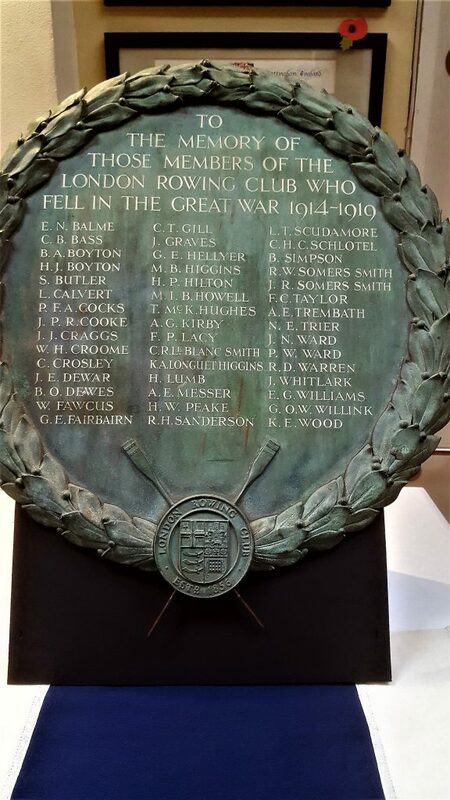 The following morning, I attended the Remembrance event at London Rowing Club. This was not an official Watermen’s event but, as it was linked to the river community, it may be of interest to add it to my Master’s record. The day started with a dedication of the plaque commemorating the fifty members of the Club who died in the First World War, their names read out by five of us who had military service, including the current Captain of LRC, Tim Grant, who had served in Afghanistan. At the lunch which followed, everyone was presented with a very fine book with the biographies of the fifty who had died. After lunch, a historian of the period, Ruaraidh Adams-Cairns, gave an address. He highlighted the sobering fact that the fifty who had died represented over 25% of the 192 LRC members who had served in the First World War, but his research had revealed that on average they had all been nearly six feet tall and most were about eleven or twelve stone. As big men for that era, and given that most had been infantry officers, he surmised that they could have been more conspicuous and thus bigger targets on the battlefield. Remembrance event at London Rowing Club. That evening I attended the Doggett’s Presentation Livery Dinner at Fishmongers’ Hall. This is a splendid, annual event when the winner of the Doggett’s Wager appears for the first time in his (sadly, we have yet to have a female winner) Coat and Badge to be presented to the Fishmongers, hear the Clerk’s report on the race and receive a Doggett’s winner’s cup. It was an evening when one was doubly proud to be a Waterman: on arrival at the recently refurbished Hall, the staircase was lined with former Doggett’s winners who later accompanied Alfie Anderson into the Hall for his presentation. Nearly two hundred attended the dinner so, as Master, I was very honoured to enter with the official guests. The Hall looked resplendent and was a fitting arena for the parade of Doggett’s winners accompanying Alfie – an unforgettable evening. The Company has had little involvement with the Thames Explorer Trust but on Thursday 8th November the Clerk and I were invited to their 30th Anniversary celebrations at the College of Arms. The reception was held in the Earl Marshal’s Court which has jurisdiction over all matters relating to heraldry. However, the reception was unlikely to interrupt Court proceedings: it last met in 1954 and that was the first occasion in over two hundred years! More immediate was the report of the Thames Explorer Trust’s activities which was a revelation for me, as they organise educational activities to raise awareness of the Thames, its history, wildlife and environmental issues. Most of their work is directed at primary school level and much of it is practical, being taught on the foreshore or riverside. The founder and current director of the Trust gave enthusiastic summaries of their work and perhaps the Company should be working more closely with them? I shall investigate whether the Trust Director, Simon Clarke, is willing to address one of our lunches.